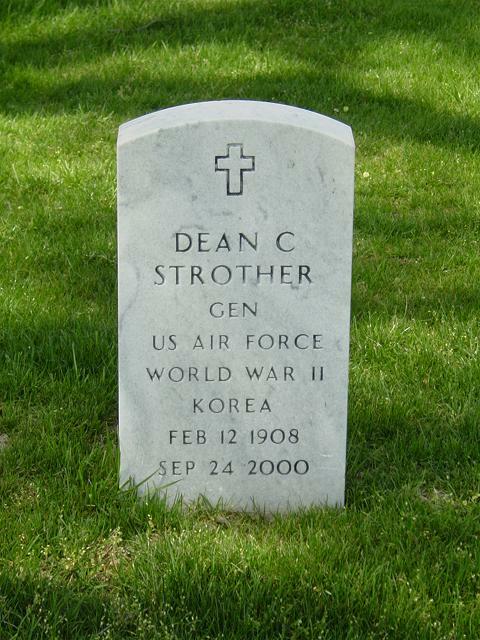 Retired Air Force General Dean Coldwell Strother, 92, died September 24, 2000, in Colorado Springs, Colorado. Services were held at 12:30 p.m. September 29 at the Air Force Cadet Chapel. Burial will be at Arlington National Cemetery, Washington, D.C.
Strother was born February 12, 1908, in Winfield, Kansas. He retired as commander-in-chief of the North American Air Defense Command after serving in the Air Force for 35 years. On December 29, 1964, he married Elsie Warmoth. He is survived by his wife, Elsie Strother, Colorado Springs; a daughter, Julia Ann; and a brother, Kenneth C. Strother, Los Angeles. NOTE: Melba Stratton Strother is his sister-in-law and is also buried in Arlington National Cemetery. General Strother was born in Winfield, Kansas, in 1908, graduated from Winfield High School in 1925 and attended Southwestern College, Winfield, until 1927 when he received a Congressional appointment to the U.S. Military Academy. Upon graduation from the academy in 1931, he attended Primary and Advanced Flying Schools at Randolph Field, Texas, and received his wings at Kelly Field, Texas, in October 1932. Some of his assignments during the period of 1932-1942 were: operations officer at Barksdale Field, Louisiana; air mail duty at the Municipal Airport, Chicago, Illinois; instrument flying instructor at Sherman Field, Fort Leavenworth, Kansas; pilot with the 72nd Bombardment Squadron, Luke Field, Hawaii; and adjutant of Randolph Field, Texas. as the U.S. representative to the Military Committee and Standing Group NATO. In April 1965, he assumed his present assignment as commander in chief NORAD and CONAD.